After a lot of hard work, my new book is finally published! To learn more, click on the the menubar tab at the top of this page for a full description of the book's contents. The book is available from Amazon as either a paperback or Kindle E-book. To summarize, this book is an all-around guide for young athletes and their parents on how to play sports, win, and have fun. It covers the essential principles of successful play, ones common to most team sports and many individual ones. It provides tips and techniques that will help any young athlete, talented or not, improve his or her play. 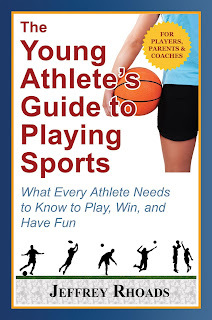 And most importantly, it presents an approach to playing sports that can help ensure a life-long interest in playing. I was pleased to receive some nice endorsements from several individuals, including Mark Murphy, the President and CEO of the Green Bay Packers and Dave Littlefield, the former GM for the Pittsburgh Pirates. Both of these men have a strong interest in youth sports, and ensuring that every child has a positive experience. Having played and worked with athletes at the highest competitive levels, they both have informed perspectives on playing sports. In addition to his Green Bay Packers responsibilities, Mark works with the Positive Coaching Alliance and is on their advisory board. Also, thanks to David Stevenson, the President and CEO of the Central Connecticut YMCA and former director of my local YMCA. In both of these roles, Dave has been a steady advocate for a balanced approach to playing sports that benefits every child. And finally, thanks to Mike Mastroianni for his support. As a high school athletic director and highly successful boys basketball coach, Mike has a keen understanding of successful play in multiple sports.